Since 1990, 34 new countries have been created with South Sudan's addition in 2011 being the latest but certainly not the last. The meeting at the UN in which Chinese representatives met with representatives from Xinjiang, Inner Mongolia and Tibet was marked by the diplomatically discourteous actions of the Chinese representatives and Rebiya Kadeer's speech. 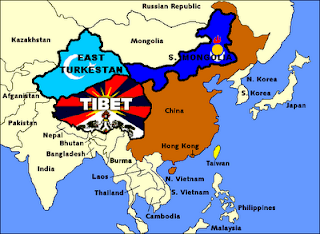 A Chinese diplomat stated that no states named East Turkestan, Inner Mongolia and Tibet existed in China, and that they were historically Chinese territory. The Chinese are obviously far from pleased and to most people East Turkestan is probably better known as China's Xinjiang Uyghur Autonomous Region. "Energy, precious metals, and other natural resources flow into China from the region. Investment flows the other way, as China builds pipelines, power lines and transport networks linking Central Asia to its north-western province, the Xinjiang Uighur Autonomous Region. Beijing’s primary concern is the security and development of its Xinjiang Autonomous Region, which shares 2,800km of borders with Kazakhstan, Kyrgyzstan and Tajikistan." 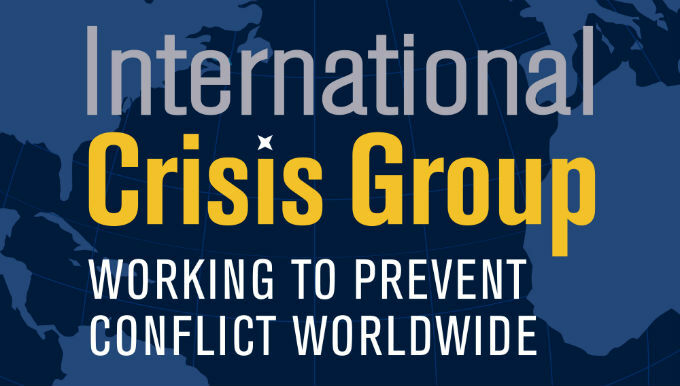 While the International Crisis Group (ICG) claims to be "committed to preventing and resolving deadly conflict," the reality is that they are committed to offering solutions crafted well in advance to problems they themselves have created in order to perpetuate their own corporate agenda. "There is a risk that Central Asian jihadis currently fighting beside the Taliban may take their struggle back home after 2014. This would pose major difficulties for both Central Asia and China. Economic intervention alone might not suffice. is of special concern: Chinese separatist organisations have trained in Afghanistan as well as Pakistan, and stability – or lack thereof – will have, Beijing feels, direct bearing on Islamist insurgency in China’s border areas." The involvement of NATO member Turkey and close NATO ally Azerbaijan is not surprising since they are simultaneously assisting the U.S. to create and sustain the threat of Chechen terrorism. Of course there is also the Pakistani ISI which is closely cooperating with the CIA and plays a central role in these operations ever since Operation Cyclone. 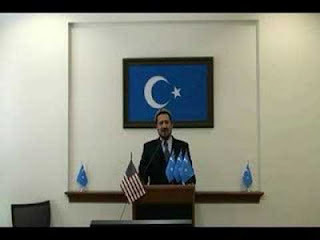 He is the first person to start the East Turkistan independence movement in the United States. In 2004, Turani set up the "East Turkistan Government in Exile" (ETGIE) and was elected Prime Minister. Turani is now the Prime Minister of a nonexistent country after his "election" in the U.S. State Department in 2004. That sounds legit but the question is why he was picked by the United States to head the East Turkestan Government in Exile. His presence in Sibel Edmonds' State Secrets Privilege Gallery should give us a clue. 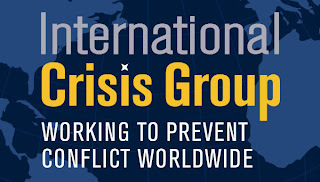 Anwar Yusuf Turani was and probably still is involved in operations in China's Xinjiang region and was therefore one target of the FBI's 'Gladio B' counterintelligence investigation. Xinjiang borders among others Afghanistan, Pakistan, Tajikistan and Kyrgyzstan. The increasing activity of the medieval petro-monarchies Qatar and Saudi Arabia in Tajikistan and in Kyrgyzstan is a particularly worrying development for China, as well as USAID's "rehabilitation" of passport offices in Osh Province. The sides discussed issues of fight against terrorism, problems of regional security and prospects of situation development in Central Asian region after anti-terrorist coalition’s troops withdrawal from Afghanistan in 2014. Importance of bilateral cooperation strengthening in fight against terrorism, separatism and extremism was highlighted. "The disarmament in the border areas between China and the four countries, namely Kazakhstan, Kyrgyzstan, Russia and Tajikistan, strengthens the mutual trust and cooperation among the militaries, maintains the peace and stability of the areas along the 7,000-odd-kilometer-long border in northern China and is beneficial to the normal development of the friendly relations among the five countries," said Luo Yongbin, deputy director of the Department of Boundary and Ocean Affairs of the Ministry of Foreign Affairs of the People's Republic of China (PRC), on May 27, 2013 during the three-day-long training course for the border disarmament inspectors from China, Kazakhstan, Kyrgyzstan, Russia and Tajikistan. Russia and China will conduct joint antiterrorism exercises in Russia’s Urals region in the first two weeks of August, a spokesman for the Central Military District said. During his tour of Xinjiang, China's top political advisor stressed containing the growth of religious extremist elements and maintaining a high intensity in the fight against terrorist activities. Terrorists killed 15 police officers and community workers, among whom 10 were Uyghur, three were Han and two were Mongolian. Police fought back, killing six terrorists and arresting eight, with the attack now under full investigation. Mainland police say they have broken up a terrorist group linked to a clash with the authorities in Xinjiang last week in which 21 people died. The group's members watched violent jihadi videos, organised "underground Koran classes" and had spread extreme religious teachings since September, the government notice said. It said they had started training for attacks in December and were planning a "major attack" in Kashgar this summer.